With facial recognition software, RIOT (prototype) reads your emotions, which in turn affect its storyline. We spoke with London-based multidisciplinary immersive filmmaker Karen Palmer, who created the installation in partnership with the National Theatre's Immersive Storytelling Studio and Brunel University London, about using what you learn in these experiences to help “navigate through fear” in everyday life. How do you approach the use of technology in your work? I want to engage people, to give them the experience of moving through fear. To me, fear is the most powerful experience to understand in our life. Because we often, as human nature, allow our fear to define who we are. How did your experiences in parkour help inspire some of your work? Parkour is about understanding yourself so you can navigate through fear. You're encouraged to explore your environment and you basically have one rule: get from A to B as efficiently as possible. We would explore the space; someone might jump over, someone might leap around, go on the walls, and as we do it we discover our sense of self and how we move reflects who we are… Parkour develops your cognitive behaviour and allows you to become more aware of yourself, and navigate through fear. For example, one time, they gave us a training session where we had to do a small jump with our eyes closed. I felt paralyzed and realized that when it comes to fear, I become paralyzed. So it enabled me to go, ‘How do I negotiate with fear in my daily life when I've got a situation that’s quite challenging? OK, I become paralyzed.’ I break it down in a manageable chunk so it's something I can deal with. You take those skills you've learned about yourself. I was inspired to create RIOT through the Ferguson riots that I saw in 2014 on social media. I felt really frustrated… by this sense of global unrest, whether it's Venezuela, Paris, Brazil, people are really rising up against the system. Maybe a couple of decades ago, you might think, ‘OK, anarchists, you know…’ Now you look at riots and go,’They just look like me, just want to eat,’ or they're just fighting because some black guy was killed, they’re not troublemakers. What I'm seeing in the media is this kind of disconnect from reality. So I want to tell the story of real people in that situation when they feel there's no other form of expression, they've got to riot; put people in the middle of that experience and give you a deeper understanding of yourself so that you become the controller of the narrative through your personal experience and your sense of moving through fear. Why facial recognition? How did you know it was the right tool? So, I work with my partners, the National Theatre's Immersive Storytelling Studio and Brunel University London’s Computer Science and Engineering Department. I've been working with Dr. Hongying Meng for the past few years, he and his students and my technology team created the software. As a creative person, I kind of went, ‘OK, what’s the experience I want? I want to reveal to people how they would be in a riot.’ So I was like, ‘It can’t be something you consciously select, it has to be something which is subconsciously revealed.’ So it was facial recognition, it wasn’t even a thing I had to be conscious of… I spoke to the professor and we decided to use artificial intelligence and machine learning to train the computer with expression. 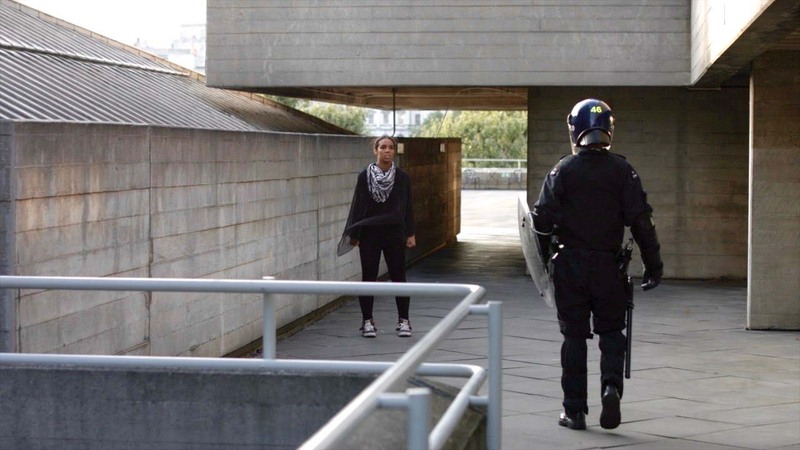 What happens is, as you watch the film and it's measuring your expression using facial recognition technology, the installation determines your emotional reaction to a riot scenario. You are confronted by a riot police office. Respond with fear and the film goes in one direction... respond with aggression it goes in another. My experiences are really a trick. I want to show you when you play them that the world on the screen in front of you reflects back who you are, I’m trying to show you that you're the creator of your own reality... RIOT measures calm, anger, and fear. So you come into contact with a riot cop in there, and if you’re angry, it has a different narrative path than if you're fearful or calm. So I'm kind of showing you that if you're calm you have a different narrative than somebody who is angry, even though you're interacting with the same person… it builds new neuron pathways in your brain. It kind of shows you, ‘I can override this operating system in a way, I can be calm and elicit the response I want.’ It reveals a lot about yourself… You can go in to learn, and master yourself if you so choose, or you can just go in and have some fun and have a really cool experience. I don't want to make something that's too heavy or too elite. I want to make something everybody can access. This is a prototype, not the finished RIOT experience. This was to show proof of concept, now I'm going deeper... I want to create a work that’s going to transport your perspective. Because we're living in an information age, but we're not getting any more sense of understanding of each other. If anything, people are becoming more divided. So I want to create two things: one, you have more insight and understanding of other people's perception, and the other one is that you learn to navigate through your own fear. I am working closely with the National Theatre Immersive's Storytelling Studio to create the final RIOT iteration. We are currently looking for partners and funding to develop it. This is like a piece in progress, a beginning of the journey. RIOT (prototype) is part of the Lucid Realities exhibition, on view until December 16 at the Phi Centre.